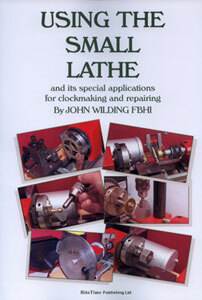 Intended for the newcomer to clockmaking and repairing with his first lathe. Deals with basic principles such as tool sharpening, simple turning exercises, the construction of jigs, attachments and accessories for the lathe. Using the lathe in the overhaul and repair of clock movements and making missing parts. Includes the construction of a Jacot attachment for the lathe, the repair of pivots in the lathe, making large bushes for barrels etc. The accessories described include, a lathe tool honing jig, making special centres used in horological work. Making a screwhead holding tool, a hand turning rest, a lathe roller filing rest, making cutter arbors etc. and wheelcutting. The lathe depicted in the illustrations is the TOYO 210.